Combining masculine pieces with feminine accents is Serene Tan’s decorating style—which makes Timothy Oulton a firm favourite in her little black book. 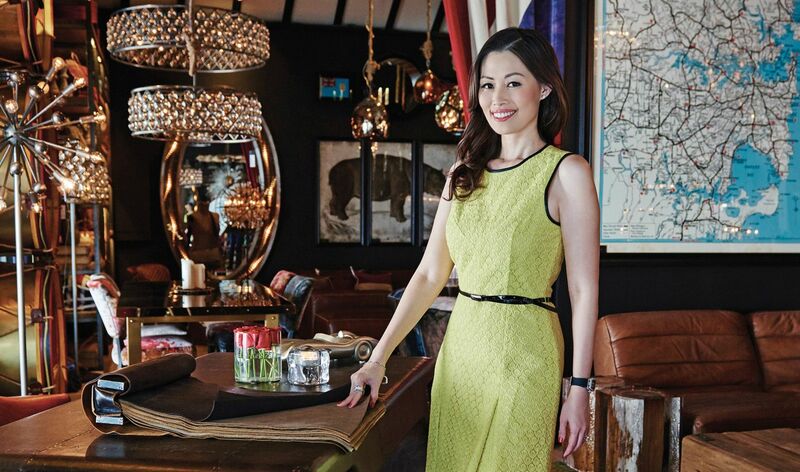 Standing among the decorative paraphernalia that makes Timothy Oulton’s Dempsey location so unique, Serene Tan bears her name well—she’s a vision of calm and poise, and is incredibly softly spoken. Such is her gentle manner that it might be assumed that the Singaporean is an easy sell, but when it comes to decorating her home, she gets right to the point. Few brands capture the British spirit quite like Timothy Oulton. Since 2008, the furniture brand has offered a quintessentially British decor, offering custom-made pieces and collections that add a touch of Britannia to any space. It’s little wonder that the brand’s Dempsey store, which opened in 2013, is a favourite among the well-heeled in search of a quirky chandelier, leather sideboard or heirloom desk. On this trip to the store, Serene had her eye fixed on a pair of crystal chandeliers and the standing Rex mirror (seen in the centre), which is adorned with bevelled crystals all around. The brand counts celebrities like Beyoncé among its biggest fans—she's said to have acquired the same mirror for her home. The Shabby sectional sofa in Savage leather is amongst the best-selling pieces at the store. Take a seat and it's easy to see why. The unique detailing featured on this piece include its raw open seams, which reveal the natural colour of the hide and add to its rugged appeal. Its generous proportions make this sofa just the seat to sink into (with a Penguin book at hand, of course) . Serene pores over the types of leather available for the sofa selection at Timothy Oulton, while discussing her options with sales manager Meljude Ang. He's one of the style advisors at the store who can suggest pieces that would best fit your decor scheme, upon request. As Serene shares, she and her husband Benjamin Kim have been bitten by the decorating bug. “It’s rare that one or the other of us makes a choice that then gets vetoed,” she explains of their buying strategy. “Although we always ensure we get each other’s opinion on a piece before buying it.” That’s why she’s likely to head back to Timothy Oulton with her husband in tow—for even more new pieces to make their nest truly a home sweet home. Timothy Oulton at Curio is located at 14C Dempsey Road, Tel: 6479 7619.